Flu season is back with a vengeance this year. What can you do to help avoid getting the flu? Here are a few tips from our providers that may help you stay healthy through flu season. Everyone 6 months old and up should get a flu shot, every flu season. The flu shot is even more important for seniors aged 65 years and older, children younger than two years, pregnant women, people with chronic health conditions such as diabetes and some people with certain disabilities. A healthy diet will strengthen your immune system, which will help you avoid the flu and other illnesses this time of year. 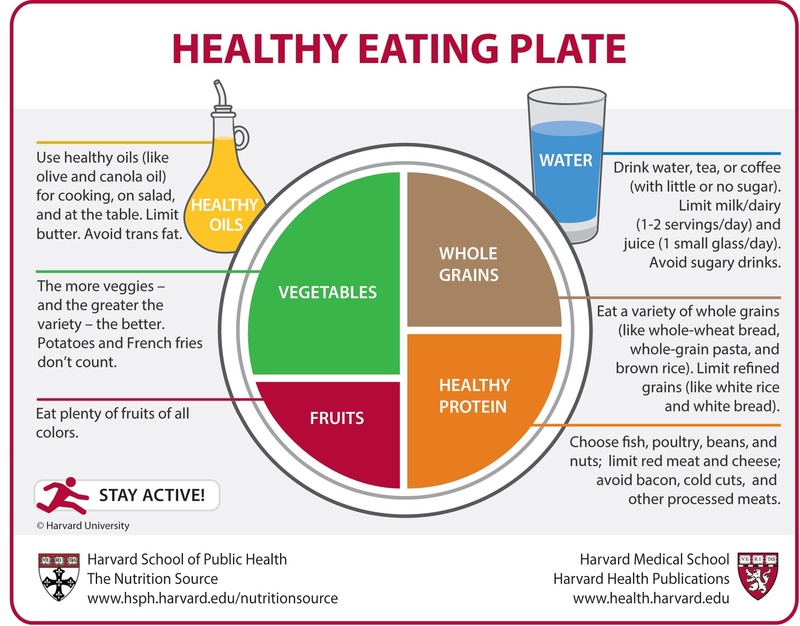 Try following the Healthy Eating Plate created by nutrition experts at the Harvard School of Public Health. It’s common knowledge but often gets overlooked. Use soap and water, and rinse your hands for at least 20 seconds. If you can’t get to sink to wash your hands, a gel or an alcohol-based hand wipe may also be helpful. Flu viruses tend to live longer than other germs, especially on stainless steel, plastic and other hard surfaces. Preventing the flu may be as easy as wiping the counter in front of you. Chlorine bleach disinfects when used properly, and disinfectant wipes can remove up to 99% of viruses. Drinking water promotes a strong immune system and helps flush away toxins. And even if you do start to feel sick, drinking plenty of water helps reduce symptoms, such as a sore throat or a stuffy nose. A recent study in Annals of Family Medicine found that exercise reduced acute respiratory illness by up to 43%, and meditation had an even greater impact. Both activities reduce stress, which can impact your immune system health. Studies have shown that if your sleep pattern is interrupted, the level of certain immune system cells in your blood becomes significantly decreased. These cells are the first line of defense against invading pathogens like the flu, and less of them means a weaker immune system response to sickness. The flu virus spreads rapidly through bodily fluids from a runny nose, a cough or sneezing. Try to avoid getting too close to those with flu symptoms, and you’ll stand a better chance of keeping yourself from getting sick, too. If you’re already sick, get treatment as quickly as you can. Treating the flu within the first 72 hours can reduce its symptoms by up to 2 days. If you have a fever, cough, sore throat or feel nauseous or very tired, stop by one of our centers or schedule your appointment online with the widget below!